Driven by volatile stock markets, stock option expensing, and shareholder advisory firm mischaracterization of stock options as non-performance-based compensation, many companies have significantly shifted away from stock options toward service-based restricted stock and/or long-term performance plans such as performance shares, performance share units, or performance cash units. In doing so, however, companies often are giving their retiring executives a pay cut in the final years of the executives’ working careers. It is not clear whether these end-of-career pay cuts are made consciously, or whether they are simply driven by retirement provisions that have not adapted yet to corporate America’s shift away from stock options. It has only been in the last few years that restricted stock and performance plans have become more prevalent forms of long-term incentive than stock options. In fact, a growing number of companies have eliminated stock options from their long-term incentive program entirely. What a change this is from a decade ago when stock options often represented 70% to 100% of a senior executive’s long-term incentive grant! What has not changed, by and large, is how each vehicle tends to be treated at retirement. Just as they did a decade ago, most companies tend to accelerate or at least to continue stock option vesting – albeit with some exercise period reduction ‒ whereas restricted stock and performance plans most often require proration for the time employed or even outright forfeiture of in-cycle grants. In the former world where restricted stock and performance plans were less prominent in the long-term incentive program, their less favorable treatment upon retirement might have been tolerable without much further thought. 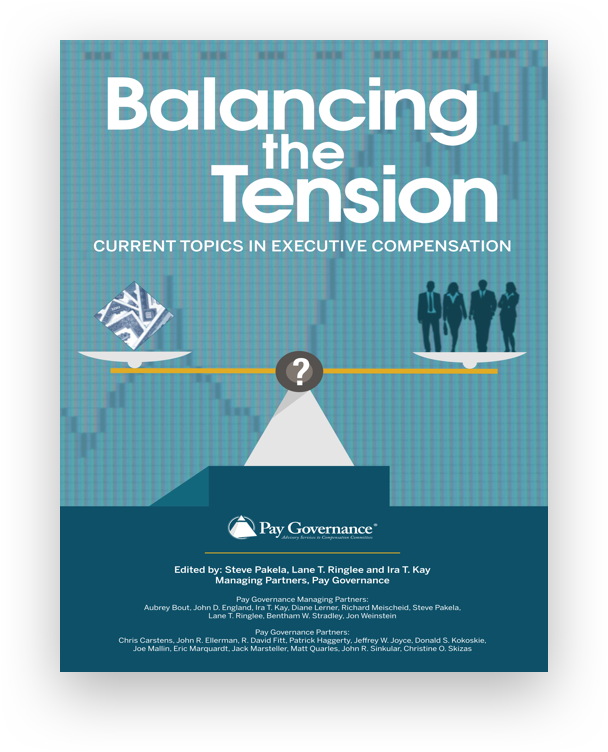 But take today’s common compensation communications use (and required Summary Compensation Table disclosure) of “dollarized” long-term incentive grant values, then combine it with retirement-triggered proration or forfeiture of significant restricted stock and/or performance plan compensation, and you have de-facto retroactive pay cuts and below-competitive pay results for long-service retiring executives. 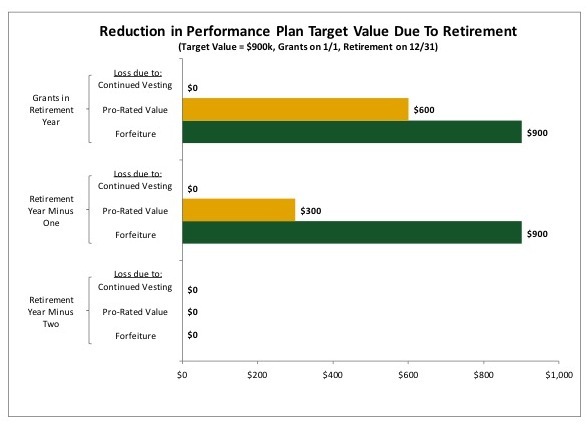 For example, at companies annually granting overlapping, 3-year performance plan awards with proration upon retirement, the retiring executive loses $.66 and $.33 on each intended performance plan dollar for the uncompleted cycles at the end of the retirement year. Perhaps one justification for proration or forfeiture could be the fact that the retiring executive will not be employed to contribute to performance achievements over the balance of the vesting/performance period. That certainly explains why the retired executive should no longer receive new annual salary, bonus, and long-term incentive awards. But retroactive cuts in pay? Cuts that would have to make pay in the years just before retirement non-competitive, given the size of most companies’ long-term incentive grant values? Moreover, proration or forfeiture of in-progress grants suggests that the former executive has no ongoing influence post the day of retirement on the achievement of long-term performance goals. No influence on actions taken during the years prior to retirement that may have a longer-term payback? And no influence on an effective succession process, the absence of which can create operational risks as well as ongoing pay issues (e.g., pay disparities because the successor must be recruited from outside)? 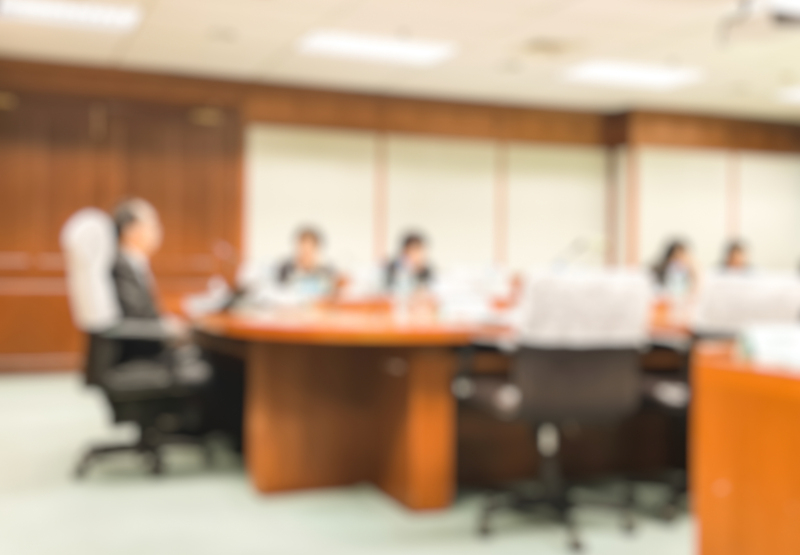 If the retiring executive’s impact is so muted, it could be questioned why the executive was ever granted long-term incentive awards in the first place. While there are cost implications to eliminating retroactive pay cuts associated with prorated or forfeited restricted stock and performance plan grants, companies may wish to explore further an unreduced opportunity to earn all prior long-term incentive grants if a new retirement definition is reached and if restrictive covenants are not violated. Unreduced Opportunity. If a long-term incentive has been granted, vesting could continue into retirement, and for performance plans could be based upon the achievement of goals at the end of the cycle. New Retirement Definition. Many defined benefit pension plans have disappeared, so it may be time to develop a retirement definition that makes sense today. Is it “62 and 15”? Is it “85 points”? 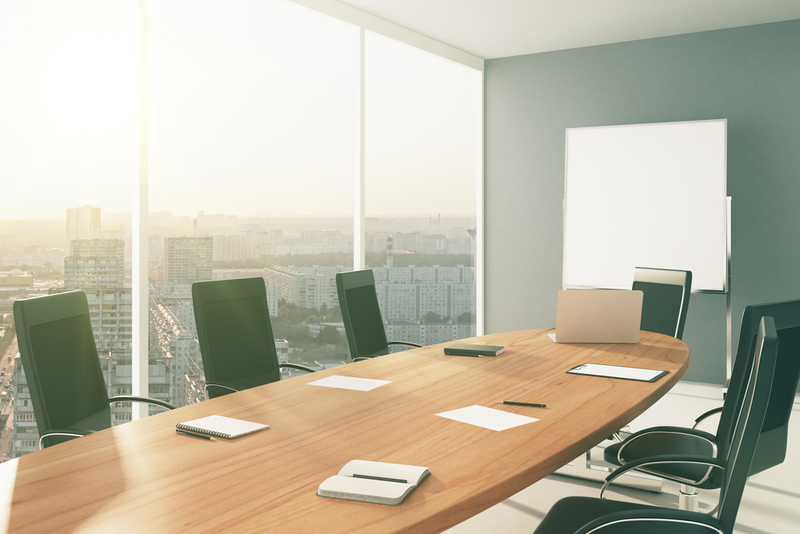 Each company should consider its own experience with retiring executives, but with the objective of identifying a retirement definition that makes it far more likely than not that the executive really is retiring rather than starting a new career elsewhere. Restrictive Covenants. Just to be sure that a retiree is not still earning long-term incentive awards while working for a competitor, annual certification of non-compete, non-solicit, and non-disparagement could be required (to the extent permitted by state laws.) By linking vesting of long-term incentive grants to restrictive covenants, as well as updating the definition of retirement, stronger handcuffs could surpass what is currently provided by proration or a forfeiture provision. For companies that consider reassessing their restricted stock/stock unit and performance plan retirement provisions, there are a number of implementation considerations. What happens with existing in-cycle awards? Should there be a different treatment for “early retirement” versus “normal retirement”? 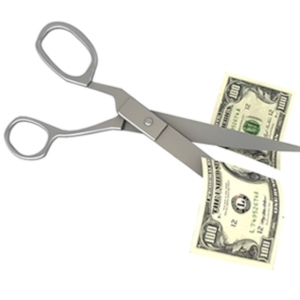 What are the new costs associated with not prorating or forfeiting awards at retirement? It is often said that a best practice is a minority practice for a number of years before it becomes a competitive practice. Allowing all long-term incentive grants to continue vesting, rather than providing favorable treatment to stock options and less favorable treatment to other awards, is hardly a competitive practice today. Nevertheless, each company should evaluate whether the difference in treatment, an artifact of the past that was implemented when stock options were the predominant vehicle, fits today’s world of long-term incentive valuation, communication, and implementation. 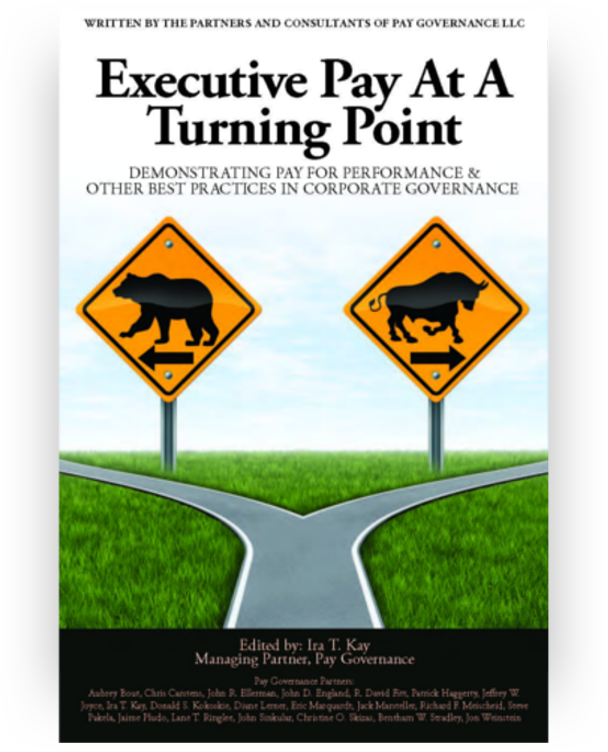 ‍General questions about this Viewpoint can be directed to John D. England by email at john.england@paygovernance.com or to Christopher S. Carstens by email at chris.carstens@paygovernance.com.